Welcome to Series 6 Exam Tutor! Do you need Series 6 help or help with other licensing exams? Series 6 Exam Tutor offers tutoring for the Series 6 Exam, the Series 7 Exam, the Series 63 Exam, the Series 65 Exam and the Series 66 Exam. As a tutor for licensing exams, we know how important it is for students to pass their exams on the first try. Series 6 Exam Tutor serves as a teacher as well as a coach. Some Series 6 Exam test takers work full time and find it challenging to allocate the hours necessary to pass the exam. A Series 6 Tutor can help motivate students. As a Series 6 Tutor, Series 6 Exam Tutor emphasizes comprehension rather than memorization. In order to Pass the Series 6 Exam, you need to understand the material. The Series 6 Exam is not as comprehensive as the Series 7 Exam but should not be taken lightly. Passing the Series 6 Exam qualifies an individual to sell mutual funds and variable annuities. 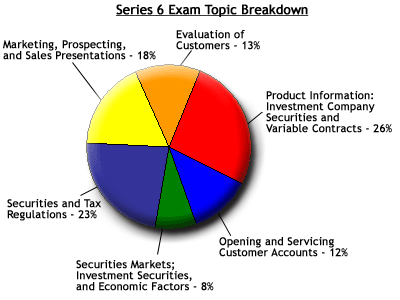 Below is a chart with the topic breakdown for the Series 6 Exam: please note that while the investment topic breakdown below is still generally applicable, the format of the exam has changed (effective 10/01/2018). You can click on the following link to see the revised Series 6 Content Outline. The primary instructor, Michael Weiss, CFA, passed the Series 6 Exam with a score of 94% and has twenty-five years of investment experience, including tutoring years. The majority of this Michael's investment experience was focused on the mutual fund industry, which is a valuable background for helping students with the Series 6 Exam. In addition, Michael has an undergraduate degree as well as a graduate degree in finance and is a CFA charterholder. Series 6 Tutoring - What should I focus On? The title on FINRA's content outline for the Series 6 Exam has the words, "Investment Company And Variable Contracts." Anyone who is preparing for the series 6 exam should dedicate a lot of time to everything related to investment companies, variable annuities and variable life insurance. These topics are not necessarily in one chapter in your book. This would apply to product specific characteristics, sales/marketing, taxes, regulations, suitability, etc.